Chocolate, derived from the cacao bean, has many beneficial compounds that can contribute to good health. The addition of ingredients in the manufacturing of milk chocolate candy, however, decreases the nutritional value of chocolate and makes this food less healthy than its dark chocolate relative. 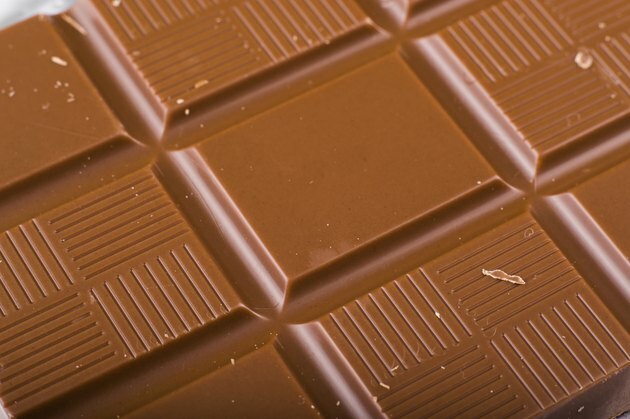 Learning more about milk chocolate and what it contains may motivate you to choose alternative treats or to switch to dark chocolate, which can be lower in fat, calories and sugar. It is important to pay attention to your caloric intake, because consuming too many calories can lead to an unhealthy weight gain. Foods high in calories can have a place in your healthy diet, as long as they are eaten in small amounts on an occasional basis. The National Heart, Lung and Blood Institute website adds that the weight gain that can accompany a high-calorie diet may also contribute to heart disease, diabetes and high-blood pressure. Milk chocolate is one of these foods that is not considered healthy because of the number of calories a small serving contains. A 1.5-ounce milk chocolate bar has 235 calories. Another consideration is the addition of high-fat ingredients to achieve the taste and consistency associated with milk chocolate. Eating a diet high in unhealthy saturated fats can lead to dangerous conditions like cardiovascular disorders, diabetes, obesity and certain types of cancer. Milk chocolate has a large amount of fat, much of it saturated fat. A 1.5-oz. serving of milk chocolate has 13 grams of total fat, 8.1 of it saturated. The American Heart Association recommends that saturated fat comprise no more than 7 percent of your daily caloric intake. If you eat a typical 2000 calorie daily diet, you can have no more than 13 grams of saturated fat per day. Sugar is another major consideration when it comes to milk chocolate. Like fat, a great deal of sugar is added to the chocolate. The sugars are refined, which can lead to health problems if consumed in large amounts. Filling up on foods high in sugar can also leave little room for more nutritious foods, which can contribute to weight gain and obesity. Carrying around excess weight can contribute to an increased risk of type 2 diabetes, according to the National Heart, Lung and Blood Institute. A 1.5-ounce milk chocolate bar has almost 23 grams of added sugar. Milk chocolate has a surprising number of important nutrients but should still be considered an occasional part of your diet rather than something you eat everyday. A 1.5-ounce serving of milk chocolate has 83 milligrams of bone-supporting calcium, as well as 1 milligram of iron. The same amount of milk chocolate also provides 164 milligrams of potassium and 1 milligram of zinc. In addition, this serving of milk chocolate supplies 86 international units of vitamin A and 2.5 micrograms of vitamin K.